As part of our ongoing effort to help you incorporate audiobooks to your daily practice, this post kicks off our new "Curricular Spotlight" series. In these posts, we'll feature titles from our catalog that can help your students get a better feel for the topic(s) you are studying. We're starting with American History because this is a subject covered at many different levels, and often is spiraled through the curriculum. We'd love to make this space more of a community - so please comment and share tips and tricks that have worked for you! First, let's talk about how you might find (or direct your students to find) titles beyond the ones featured here. Remember that we add new titles to the catalog every month, so there is always something new to be discovered! The new desktop browsing structure makes finding titles much easier. If you are viewing this post on a computer, you can click the links to visit each section - similar updates are coming to the mobile app versions, but for now all the fun is happening here in web browsers. 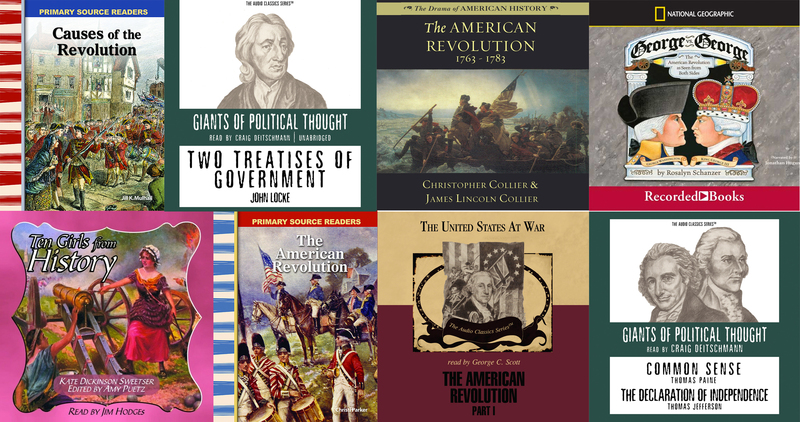 Subject Areas > History > U.S.
To find these specific titles, use the multivariable search function. Remember that these searches are designed to be most inclusive, so narrow your results by using the dropdown menus to restrict results for faster searching. Help your students and other teachers find titles by including title recommendations in newsletters. Use physical reminders like bookmarks and stickers to make everyone aware of their options! Students who dislike or struggle to find interest in written texts about historical events might be intrigued by audio! One of the many reasons audio content is great for students is that the burden of decoding is removed. This enables students to focus in on the content. Unlike video, which can easily become a passive activity, audio content provides contextual information - like pronunciation, accents, and emphasis - that are often missing from text. However, because listening skills are often not explicitly practiced or taught, it can be helpful to provide students listening activities that help them to focus on what they're hearing. Drawing, coloring, and doodling are good quiet activities for listening. Encourage students to draw images related to the content they're hearing, or provide coloring sheets themed to match the audio content. Graphic organizers and information organizers help beginning listeners keep track of what they're hearing. For even more ideas on how to help students become better active listeners, check out our Pinterest board!